Skacel Collection, Chuck Wilmesher opens 2015 to share what’s new for the NEW YEAR on the Yarn Thing Podcast with Marly Bird. Marly first met Chuck in person on a trade show floor. It sounds like they both appreciated the positive vibe of the other! Chuck Wilmesher grew up in St Louis, got his MMR moved to Los Angeles after graduate school and worked with Mattel, specifically in marketing toys for boys. He worked with a movie marketing research company. While there he met a fellow who offered to teach him to knit in 2007. He fell in love in fiber! He says about that time he wondered what he wanted to do when he grew up. 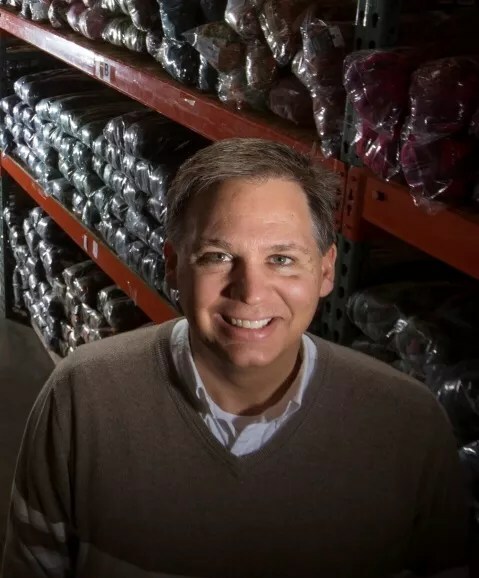 He attended a men’s knitting retreat in the Pacific Northwest, met Karin Skacel and kept in touch with her, he later asked if she needed a yarn rep. She didn’t but they kept communicating until he moved to Seattle and started with the company. He is the Director of Product Research and Development, working with the mills that produce product for Skacel and has been with Skacel for four years. Pattern support is important with new yarns so they work with designers in-house and outside of the company. They have a magalog (magazine/catalog) which has been a great marketing tool to Local Yarn Stores and yarn buyers. Artfelt is a product that Mr. Schoppel created after his kids had an felting project in school. The uses for Artfelt have been a wide variety of things, the most recent magalog featured an article that shared felting for the head! Karin has been teaching classes at various events, such as the upcoming TNNA and Vogue Knitting Live. Fiber Factor came about as inspiration of the Fashion Design contests on television. It has to be a bit different though, in that a knitting design generally can’t be completed in a day. It started two years ago, and once the competitors were selected, challenges whittled them down to four finalists and the winner, Lauren Riker has made appearances on many different programs. Also, the other contestants led Knit-a-Longs (KALs) through Fiber Factor and with Skacel sponsorship. Skacel and it’s production crew learned a lot and are applying that to a Fiber Factor II coming up very soon! Chuck says they are going to have the designers create and tech edit their own patterns, which will be posted in Ravelry to be purchased right away, which will give the contestants some feedback and compensation for their work right up front, whether they win the challenges or not. That may sound intimidating, but it’s a huge learning experience for contestants who may be inexperienced. The contestants will be announced March 13, Josh Bennett will continue to coach the contestants and new content will post EVERY Friday at 4 in the afternoon (I am assuming this is Pacific Coast time, as Skacel is based in Seattle). They are making every effort to make this accessible to mobile devices, so there is a lot of tech stuff being addressed. Here is the link in YouTube to subscribe! Another new thing that was shared from Skacel is new Addi Flipstix! These are new double pointed needles (you’ll find them bright and cheerfully colored) that have two different kinds of points on EACH needle! One end is Lace Point and the other is the popular Addi Turbo point! How cool is that, you’ll always have the right point for your project and less needles to tote around. Sizes range from size 0 to 11 in 6″ or 8″ lengths. We mentioned earlier they will be at TNNA in Phoenix, AZ, next week and VKLive NYC January 16-18, also at Stitches West in February 19 through 22. We all look forward to seeing Skacel there. Congratulations on your first podcast appearance, Chuck, you did an awesome job! We’re so happy your first time was with us! In case you missed it today’s visit with Chuck was archived in Blogtalk: http://www.blogtalkradio.com/yarnthing/2015/01/06/skacel-collection-chuck-wilmesher and is also available in iTunes. I would FLIP if I won the Addi Flipstix. I love my Addi Sock Rockets. I love the idea of being able to FLIP my needles to make them more versatile! Thanks for a very good interview. Interesting guest! I enjoy the back stories about how people begin their knitting journey. Why flip flop from sharp to blunt tips and back again? flips have it all! I live in CA.. where we wear “Flip” flops all year…LOL!!! Great pod cast!!! I would just flip if I knew what flip sticks were,! I would flip over Addi Flipstix. I love my Addi Turbo Lace needles. Great episode, Marly! I would flip if I won my first addi needles! I flip between knitting and crochet all the time. I really enjoy your podcast as you bring in people that speak to both crafts. Thank you. Great podcast. What a great job he has. I would flip for those needles. What a great idea. I am so flip-ping excited to meet Marly at the Pajama Party at Stitches West! Great podcast as usual. What a great idea to have two options in one needle – I would flip to own a pair about size 5! I would FLIP for Flipstix! Flipsticks sound like a terrific product. I would flip if I owned a pair.. I usually flip over the Magic Loop method, but would love to try the FlipStix. I flip for Addi needles. My favorite are the sock rockets. The Flip Sticks look pretty cool too. If I won those Addi Flipstix, I would flip! I would really flip over those new Addi Flipstix needles. I hope that I win. I would just love to win a a pair of Flip sticks, they sound perfect! I absolutely would Flip over a new pair of Flip Sticks! Thank your for the informative and very interesting podcast! I would Flip at a chance to win Flip sticks! Really liked his work history story. I love the idea of the FlipSticks! So useful and convenient to be able to flip the needle over to get to the sharper or blunter end. I am also excited about the next season of Fiber Factor. I watched last year and loved it. I think the changes will make it even better for the designers and the viewers! I am interested in the artfelt as well. Skacel seems to have so many great things going on-lots of new and fresh ideas-love it!! It was so cool to hear from Chuck everything that Skacel has their hands in. I’m going to see if I can get the Fiber Factor set up to watch on my Internet-connected TV, then it can be just like watching a “normal” TV show. My wife would probably flip out if I find a way to turn our TV into a vehicle for showing knitting shows…. What a great idea – to be able to flip the needles from blunt to sharp. I can’t live without my addi-turbos and would love to add some Flipstix to my collection! As usual, I thoroughly enjoyed your podcast. The Skacel story is very interesting. I love the idea of the flip needles and plan on owning some in the future. I didn’t know about The Fiber Factor until this episode. Happy to say I watched it for the first time last night. Keep up the great work! What a great idea- to be able to flip the needle to the type of end you’d prefer for that project. The flip DPN’s are a fantastic idea. Can’t wait to see them. What an AMAZING concept to have DPN;s that flip!!! What a wonderful interview. Marly you interview the best people. First of all, I adore my AddiClicks and frequently recommend them to friends: they are in such constant use I almost need to buy a second set! It was great to listen to this episode and hear all about the history of the company. Chuck was a great interviewee. Flipsticks are a brilliant idea for all of us who do tons of socks as take along projects and I would FLIP to be able to spread the word about those, too, if I had a set to carry around in my project bag. I really love my Addi needles. I would tOtally flip for those new flip sticks. Wonderful interview. I didn’t know about Fiber Factor at all but will definitely tune in to see what the designers come up with. Love the podcast Marly—I listen & flip for your podcast while I knit/crochet or trundle around my house! If I am not lucky enough to win a flip stick needle, I will need to hunt them down at VKL…great idea! I flip for great new tools like flipstix! I love Addi Turbo circular needles, and I know I would flip over the FlipStix, too! I enjoyed hearing about the different Addi products and their background. Thanks, Marly! I would flip to win these needles! Love your podcast Marly! What an excellent idea to have needles with two types of ends and you can just flip them depending on your project! Just when you think you’ve seen it all! Thanks, Marly! Chuck is a lot of fun! I would flip out to use the flipstix… What a brilliant idea? And how did I not know about Fiber Factor? I’ll definitely be tuning in in March. Thanks for another great episode! I wonder that no one ever thought of putting a different end on the needles, letting you flip to your fave point. The simplest ideas are sometimes the most ingenious! To flip your needles sounds like a fun way to fix and knit your projects. Please flip my luck and make me a winner. My football team just lost, my baseball team lost, my politicians lost. I just want to win a knitting surprise! I love the idea of being able to FLIP my needles to get the blunt or sharp tip I need. What an awesome idea!!! Flipping over flip sticks. This is a two for the price of one. I love it and will be adding to my needle collection. Thank you, Skacel!!!!!! Another great show, you never disappoint! I would flip if I won the needles! Thanks so much for your show!